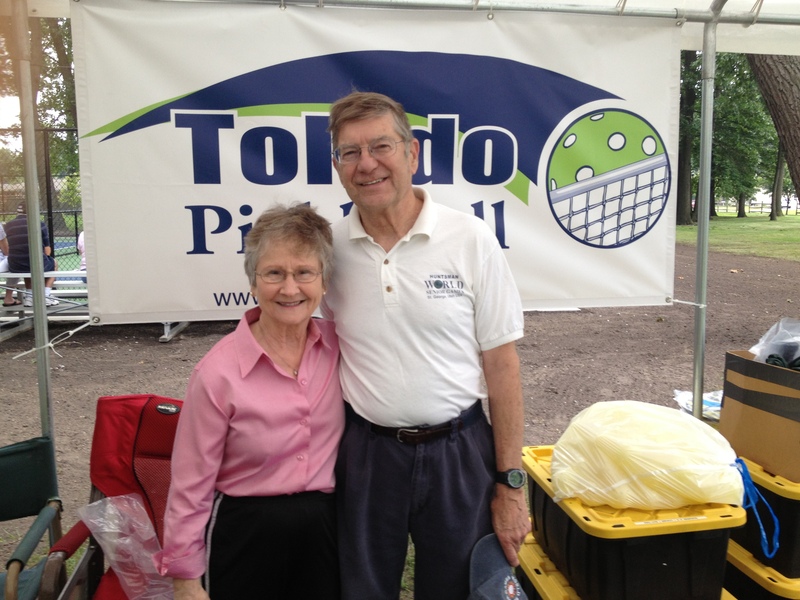 Toledo Pickleball Teams Up With the Mayor of Holland – Pickleball is Thriving in Northwest Ohio! success of that collaboration was clearly evident on Saturday when newcomers to the sport joined Toledo Pickleball Club members and players to celebrate the completion of the courts. Following a few short speeches and a ribbon-cutting, Toledo Pickleball members gave a quick demonstration of an abbreviated game. Then the new players hit the courts using the balls and composite paddles that Mayor Yunker purchased for Holland residents to try out while they learn about the sport. 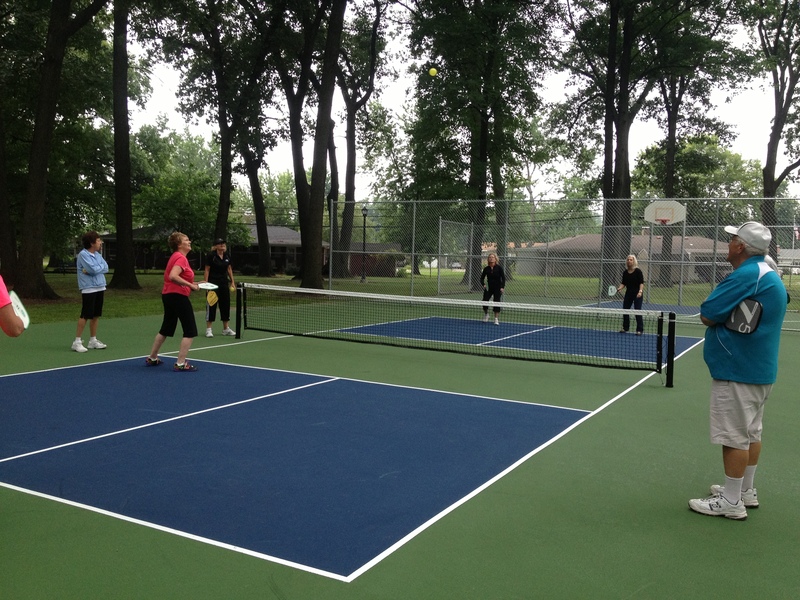 The number of Toledo Pickleball players in attendance matched up well with the number of newcomers–we not only provided instruction and encouragement, we retrieved balls for them so they could use their energy to get the feel of the game and absorb the rules. The courts are open to the public seven days a week and rules for usage/wait times are clearly posted. The mayor plans to offer two morning sessions–probably from 9:00 until noon, Tuesdays and Thursdays–for players aged 50 and over to learn and practice the game. We will post the schedule when he firms up his plans. In the meantime, stop by and try out the courts. We know this location is excellent for many of our players and are hopeful that some of the new Holland players join us in Rossford. 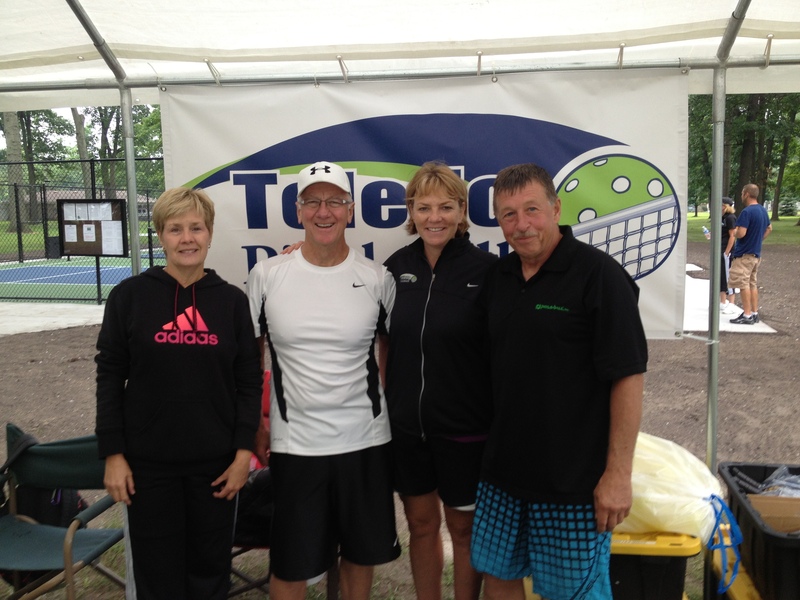 Once again, we thank the many Toledo Pickleball folks that generously gave their time to assist new players. We were so pleased to have in attendance JoAnne and Mike Tressler, our original Toledo Pickleball ambassadors who brought the game to Toledo, so we could introduce them to new players and express our gratitude for their efforts–every Toledoan currently playing pickleball at any of the locations we advertise on our blog should be aware that these two people are responsible for bringing us together. Helping the new players at the Holland courts opening ceremonies. Late-breaking story: The storm held off until our celebration was nearly complete. 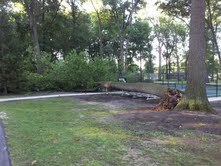 Unfortunately, one of the shade trees was toppled and took out some fencing and the nice new bleachers. At this point, we don’t think the court surface was damaged. We are confident that the Mayor and his maintenance team will make any necessary repairs as quickly as possible–but there is some work to be done. One court is completely untouched and playable. Tree down at Holland courts after the storm. Unbelievable, was anyone still there? No, thankfully everyone was gone! Nice to see you there, thanks for coming. Sorry I didn’t have more time to speak with you. Marsha, you and the group you inspire are special. Great job. One more feather. In your cap. Keep up the good work. Are you going to form teams? If you are how do we register? You can advise them to check our web site at http://www.hollandohio.com for Pickleball updates, or contact the Village Office at 419-865-7104 or email Leslie Ferman at zoning@hollandohio.com or mayor@hollandohio.com. The only thing I’m doing right now is closing the courts on Tuesdays and Thursdays between 9AM and 11AM for 50+ players with emphasis on new senior players. I’m trying to build a senior group. You can advise them to check our web site at http://www.hollandohio.com for Pickleball updates, or contact the Village Office at 419-865-7104 or email Leslie Ferman at zoning@hollandohio.com or mayor@hollandohio.com. The only thing I’m doing right now is closing the courts on Tuesdays and Thursdays between 9AM and 11AM for 50+ players with emphases on new senior players. I’m trying to build a senior group.